Snow day: denim mini, sequinned sweater, Chanel-style jacket, and fierce booties! We have exactly one week to go before Christmas…and as I’m looking out the window, I see the thing I always dread most at this time of year. It’s snowing!! But since Robin and I have invested our annual vacation budget for the next 20 years into our new condo instead – I’m kidding (a little!) – I guess I’ll just have to get used to the idea of occasionally dealing with some snow at Christmastime!! So far the white stuff isn’t sticking…and I have my fingers firmly crossed; hopefully (for me, at least!) you won’t see it making an appearance on my blog next week!! Ready for another Fun Fashion Friday, folks?! 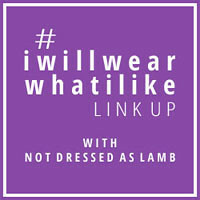 Head on over to Fashion Should Be Fun to link up and join the party!! Adorable! Love your style! Your hair is great! pretty top my dear. MERRY CHRISTMAS and a HAPPY NEW YEAR!